Slopestyle (soon to be known as Freeskiing) is a ski competition held in a terrain park built to certain specifications. Each skier / rider performs their most difficult tricks striving to get the highest alititude off the features / jumps. Skiers / riders execute different types of tricks mixing them together into a seamless flow as they decend through the park. 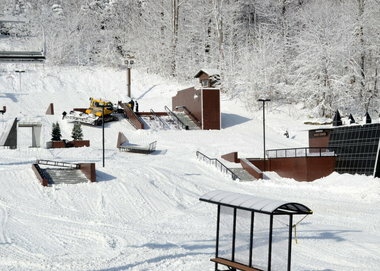 Slopestyle includes halfpipe and the terrain parks. Slopestyle is currently one of the most popular on slope competitions for both watching and taking part in. It has consistantly been a mainstay of the Winter X Games, is recognized as FIS Freestyle Skiing, and was included as a full metal event for the first time in the 2014 Winter Olympics at Sochi, Russia.